This is an autumn of anniversaries in two of New York’s most important museums. At the Museum of Modern Art, “Bauhaus 1919–1933: Workshops for Modernity,” the exhibition saluting the ninetieth anniversary of the opening of the legendary German school of art, architecture, and design, also marks the eightieth anniversary of the founding of the Modern. Up north and to the east, the Guggenheim is capping the celebrations of the fiftieth anniversary of Frank Lloyd Wright’s still astonishingly audacious building, now freshly restored, with a stirring retrospective of paintings by Vasily Kandinsky, whose work was at the core of the Guggenheim’s mission when it opened its doors as the Museum of Non-Objective Painting on East 54th Street seventy years ago. The year 1939 was also highly significant in the history of the Museum of Modern Art: it was in November of that year, mere months after mounting a pioneering Bauhaus show late in 1938, that the museum unveiled its very own new building on West 53rd Street, a structure whose spare lines were closely related to the vision of a new architecture that had been promoted at the Bauhaus. To recite these neat round numbers is to be reminded of the almost boundless excitement about modern art that animated some New Yorkers--and some Americans--in the second quarter of the twentieth century. I sense in this fall’s heartfelt salutes to Kandinsky and to the extraordinary personalities in the fourteen-year history of the Bauhaus, where Kandinsky taught, a re-affirmation of that old modern, or modernist, enthusiasm. Under the directorship of Richard Armstrong, the Guggenheim has a chance of awakening from the nightmare of the Thomas Krens years, and the Kandinsky show has inspired an extraordinary response, with crowds lined up around the block to see the work of one of the most uncompromising, hell-bent, and, sometimes, inscrutable of all the masters of modern art. And I have a hunch that “Bauhaus 1919–1933: Workshops for Modernity” is going to be that most glorious and rare of museum events, a blockbuster with brains. The Modern, which has made more than its fair share of missteps in recent years, has this time around done itself proud. The curators involved are Barry Bergdoll, chief curator of architecture and design, and Leah Dickerman, a curator in the department of painting and sculpture. They are impressive scholars who treat the variegated products of the Bauhaus, which range from lamps and coffee pots to paintings, as part of the historical record and as works with a freestanding value. This supercharged exhibition is about nothing less than the triumphs and tribulations of modernity. Consider for a moment the year 1919, when the Bauhaus opened its doors in Weimar. The very mention of that year (and of that city) sends a chill down the spine. A hideous war had ended. Europeans at last had reason to hope. But in retrospect we can see that the cataclysms that enveloped the continent only twenty years later were already set in motion. To return to the art of Kandinsky and to the history of the Bauhaus is to feel, once again, both the promises and the disappointments of those years, and how confoundingly they were sometimes intermingled. Progressive-minded artists, whether Marxist or not, were following the Soviet experiment, which was at first apparently friendly to the avant-garde--Kandinsky experienced it at first hand, living in Russia from 1914 to 1921, when he obtained an appointment to teach at the Bauhaus. Arriving at the Bauhaus, a state-supported school in a country whose new democratic institutions were always threatened by the forces of reaction, Kandinsky found himself amid a group of creative spirits, invariably the products of bourgeois society, who sought, individually and collectively, to revise the nature of that society. At the Bauhaus, teachers and students talked and argued about everything--brilliantly, expansively. What was the place of artisanal production in an increasingly technological society? Were the arts a matter of individual expression? Would a new, more egalitarian society require a new, more egalitarian--and perhaps more impersonal--art? And until that new society became a reality, could radically new forms of expression be reconciled with capitalist methods of production? To these questions they offered many answers, most often in the form of actual objects and works of art, nearly all of them outrageously lovely, some of them indisputable masterworks, which now fill the galleries on the sixth floor of the Museum of Modern Art. Certainly, the Bauhaus had its fair share of ideologues, among them Walter Gropius, the architect who was director from 1919 to 1928, and wanted to create a new unity of the arts. But the truth was that there could never be any definitive answer, any ultimate Bauhaus faith: that was part of the school’s greatness. And then Hitler came to power, and the questions could no longer be asked openly, at least not in Germany. New York--indeed, America--had nothing to do with the formation of Kandinsky’s art, and next to nothing to do with the dream of re-imagining the visual world that animated the Bauhaus. And yet in New York now, at a time when artistic expression seems more than ever at the mercy of impersonal technological forces, the questions that these men and women asked several lifetimes ago seem fresh, pointed, essential. In part this is because so many of the key figures at the Bauhaus ended up in America, including Gropius, Herbert Bayer, László Moholy-Nagy, Marcel Breuer, Ludwig Mies van der Rohe, and Josef and Anni Albers. In America, the alumni of the Bauhaus, the teachers and the students, were formidable émigré presences, romantic optimists who to one degree or another had been mugged by reality. On American soil they picked themselves up and became preoccupied with new versions of the same questions about the relation between artistic innovation and industrial production, and the place of the individual in bourgeois society. Their impact on many aspects of America, from the art of the avant-garde to Madison Avenue ad campaigns and the postwar skyscraper style, was incalculable. If a Bauhaus show now seems like the most natural thing in the world-certainly the most natural show to encounter at the Museum of Modern Art--it is to some extent because the Modern long ago waged the fight for the acceptance of tubular metal furniture, sans-serif type, geometric carpets, and paintings by Klee and Kandinsky. From Good Old Modern, Russell Lynes’s history of the museum, I learn that New York did not exactly embrace the Bauhaus show of 1938 with open arms. Lynes quotes the newspaper attacks on the exhibition: “confusing, and still worse … gadgety,” “clumsily installed,” “little short of a fiasco,” “chaotic.” One reviewer found “something essentially heavy, forced and repellent in most of the Bauhaus work.” Yet Alfred H. Barr Jr., the museum’s founding director, would not be deterred. He had spent a few days at the Bauhaus two years before the museum opened, and there he discovered a vision of the unity of the modern arts that would influence the shape of the Modern, which promoted not only painting and sculpture but also photography, architecture, and design. The exhibitions of inexpensive, well-designed household objects that the museum inaugurated in the late 1930s, although sometimes criticized as a capitulation to market forces, were in fact Barr’s admiring response to the old Bauhaus project of bringing modern taste to the masses. The revolutionary dreams of the Bauhaus became our everyday realities, and in some cases our everyday banalities. And the two great shows being presented at the Museum of Modern Art and the Guggenheim Museum this fall allow us to go back and figure out what went wrong--how the glorious promise of the Bauhaus became so terribly tarnished, and in so many respects misunderstood. Is it possible to go back to the future? I am not sure. But the other day, as I stood at the top of the ramp at the Guggenheim, it really seemed like a possibility. Just above my head was Frank Lloyd Wright’s skylight dome, at once extravagant and austere, the work of a man who had deeply impressed many European architects, including Gropius, and had in turn been affected by their work (although he denied it). Looking across the rotunda, I could take in the unfolding spectacle of Kandinsky’s late paintings, in which his perfervid romanticism had cooled to a Mozartean classicism--witty, delicate, lyrical, Olympian. Standing there, near the summit of the great spiral, I did believe that the old modern hopes could be hoped once again. The Bauhaus show opens thunderously, with a cry of optimism. It is Johannes Itten’s almost eight-foot-high Ascent and Resting Point, a cacophonous, visionary abstraction--a fantastical cathedral made of rising circles and triangles in hot, strident colors. And the exhibition’s end is pianissimo, with five magnificent works by Paul Klee, ranging from the impassioned geometry of Fire in the Evening and Highway and Byroads to the mystical geology of Castle Garden and the tragicomedy of Mask of Fear. In between, a museumgoer is engaged by a bewildering array of objects and works of art, somehow gathered together so as to create an entirely convincing whole. Anybody who loves the decorative and graphic arts cannot fail to be entranced by this gathering of modern delights, which includes the sometimes fantastically shaped pottery pitchers produced in the early years in Weimar, the intricately woven hangings of Gunta Stölzl and Anni Albers, the precipitously asymmetrical designs for posters and books and magazine covers by Bayer and Moholy-Nagy, and Breuer’s sleek, tubular metal furniture. There are architectural models, photographs, set designs, children’s toys and furniture, ashtrays, fabrics, wallpapers, chess sets, and much, much more. “Bauhaus 1919–1933: Workshops for Modernity” refocuses the story, conveying an especially strong sense of shifting goals and diverse personalities. The building that Gropius designed for the Dessau Bauhaus in 1927--represented at the Modern by a beautiful model of the striking, meandering structure, with its interlocking wings--is generally seen as the heart and soul of the institution. But here Gropius’s Dessau building turns out to be only one element in a complex evolution. Bergdoll and Dickerman wish to emphasize the fluidity of the Bauhaus. In their telling, the fundamental courses dedicated to general principles of design, which influenced generations of art educators in the United States, seem less important than the intense activity in workshops devoted to weaving or metalwork, so that we have a sense of the Bauhaus as somewhat decentralized, composed of a number of overlapping force fields. Diversity, not unity, is the keynote in this brilliant new portrait of an institution that was for more than a decade regarded by many as the mecca of modernism. A lifetime--certainly a good deal more than fourteen years--seems to separate the folkloric earthiness of the early Weimar years of the Bauhaus as seen at the Museum of Modern Art from the arctic cool of some of the later displays. In the beginning there is a mood of barbaric fairytale adventure--in Lothar Schreyer’s Death House for a Woman, a modern interpretation of a medieval recumbent funerary figure, and in the throne-like, crazily hyperbolic African chair designed by Breuer and upholstered by Stölzl. At the end there are students’ architectural drawings done under the aegis of Mies van der Rohe when he was director of the school in its very last years, works that partake of the master’s autocratic, elegant chill, and which can make the machine-tooled work of a few years earlier look friendly by comparison. Although the exhibition layout is essentially open, with spaces flowing one into the other, Bergdoll and Dickerman have skillfully provided us with peak moments, interludes, striking glimpses, and vignettes. There is a partial reconstruction of one of the houses that Gropius designed at Dessau for the key teachers, in this case Kandinsky’s dining room, with its dark walls, its rather unappealing, awkward geometric furniture by Breuer, and Kandinsky’s own On White II hanging on the wall. It is extraordinary to see Klee responding to the work of students, many of whom had been so profoundly affected by his ideas about structure and composition. The subtleties of his Vocal Fabric of the Singer Rosa Silber, a modern re-imagining of a page from an illuminated Renaissance songbook, is only further enriched when seen near some magnificent Bauhaus weaving. And the radiant geometry of Klee’s Architecture of the Plane and May Picture are fascinating to study in relation to several of Josef Albers’s rich yet astringent stained-glass windows. Everywhere in the show I felt both the pull toward a unified Bauhaus style and the tug of many individual visions. It is in the nature of the Bauhaus story that it is many stories. And not all of them are easily told in an exhibition. When the architect Hannes Meyer took over as director in 1928, he wanted architectural form to be directly derived from a leftist analysis of social and political imperatives, and he was seen as moving away from Gropius’s more formalist orientation. Meyer’s vision--reflected here in drawings and photographs related to his Federal School of the German Trade Union Federation, completed in 1930-cannot register as clearly in an exhibition as certain other achievements, but Detlef Mertins’s essay in the catalogue of the Modern show fills in the picture. In order to understand the relationship between Gropius’s functionalism and Meyer’s functionalism, one must grapple with the subtle and not-so-subtle differences between an architecture grounded in social idealism and an architecture that aims to respond to particular social situations and dynamics. The excellent catalogue is organized around a range of brief essays by a number of scholars, each of which focuses on an individual object or group of objects. The essays zero in on specific works: Moholy-Nagy’s experiments in enamel paintings, done by sending specifications to a fabricator; Alma Buscher’s shipbuilding toy, a collection of variously colored and shaped blocks, and its relationship to ideas about childhood; the wallpapers that were developed at the Bauhaus, and were the only products still marketed under the Bauhaus name during the Nazi years. To tell the Bauhaus story as a seamless, end-to-end narrative may be impossible. Too much went on. I find it interesting that the catalogue of the other major ninetieth-anniversary Bauhaus show, which opened in Berlin in July, is also organized in terms of an array of brief, highly specific essays. Museumgoers who catch the Bauhaus bug will want to buy not only the Modern catalogue but also the English-language version of the German one, Bauhaus: A Conceptual Model (Hatje Cantz). Readers who want to further explore the controversies that have always surrounded the Bauhaus should consult two excellent essay collections, Bauhaus Conflicts: 1919–2009: Controversies and Counterparts (Hatje Cantz) and Bauhaus Culture: From Weimar to the Cold War (University of Minnesota Press). The Modern has also published an English version of a terrific little book about the dominant figure in the textile workshop, Gunta Stölzl: Bauhaus Master, which juxtaposes Stölzl’s drawings and weavings with excerpts from her diaries, letters, and articles. The result is a fascinating portrait of the Bauhaus artist as a young woman. Born in 1897, the daughter of a progressively minded school principal, Stölzl studied at the Royal School of Art and Crafts and served as a Red Cross nurse in World War I before being accepted at the Bauhaus in 1919. Like many women at the school, she was pushed into the weaving workshop, where she proved herself a great innovator--until it became evident to most of the students, in the mid-1920s, that Stölzl, and not the painter Georg Muche, should be the master of the textile workshop. With her elevation to master in the summer of 1926, she became the only woman to earn that title at the Bauhaus. Through her letters and diaries we gather the picture of a young woman of astonishing passion and determination. She created a scandal at the Bauhaus--progressivism has its limits--by giving birth to her first child some five weeks after marrying the father, Arieh Sharon, an architecture student at the school. Finding her way to Switzerland amid the collapse of the Bauhaus, she continued her career there. She died in Zurich in 1983. Reading Stölzl’s early letters to her brother, who was a lawyer, you feel all the romantic idealism of those years, the fearlessness about bucking conventions, the ardor with which art and life were embraced. In one brief memory she evokes a spirit of adventure and discovery that brings to mind the fictions of Nerval. “On long walks through the Thuringian Forest,” Stölzl writes, “we came to an old glassblowing workshop and there we found in the attic old samples of completely fantastic, colorful glass animals--which we then also gave to [Paul Klee]--I seem to recall that he was very pleased.” At the Bauhaus there was a love of fantasy as well as a love of functionalism. And although they were reluctant to admit it, functionalism sometimes became a form of fantasy. One certainly feels this in the costume parties and theatrical events that were so essential a part of life at the Bauhaus. Gropius comes across in many accounts of the school as controlling and megalomaniacal, but it is one of the fascinations of the Bauhaus that he surrounded himself with men who were his equals and, in the case of Kandinsky, perhaps a more significant figure in the international avant-garde. With artists of the intellectual caliber and artistic daring of Klee and Kandinsky on the faculty, Gropius’s insistence that all the arts were ultimately one art could hardly be the last word, at least not for everybody. It is difficult to imagine that he did not understand this. Could it be that somewhere in his calculations was the thought that conflict was necessary in a great educational institution? By the time Kandinsky arrived at the Bauhaus in 1922, he had already proved that he could act as freely as any artist alive, perhaps more freely. Going through the early phases of the retrospective at the Guggenheim, I found myself thinking that no other artist had ever broken so definitively with the old sense of a painting as a mirror of the natural world, rejecting the afterimages of perspectival space and naturalistic color and Euclidean physics to which Matisse and Picasso were devoted even when they were at their most abstract. At first it may seem a paradox that Kandinsky was born in 1866, more than a decade before Picasso and Braque, but perhaps this explains his profoundly romantic spirit, a nineteenth-century spirit awakening to a twentieth-century vision of soaring mountains, galloping horses, swift-moving clouds, all turned into abstract gestures, motifs, glimpses, glances. His color is the strangest and most unexpected in modern art, with wild confrontations of strong, divergent hues set alongside colors that have been whitened and grayed and mixed (and mixed again). The effect is clamorous, disquieting, a play of moods, swiftly changing, flashing, disappearing, re-appearing. As for space, it is flexible, fluid, constantly improvised, a coming-into-being. At the Guggenheim, some of the greatest paintings of the years leading up to World War I form a magnificent group in the double-height room just off the beginning of the ramp. They are astral abstractions, topsy-turvydom apotheosized. Kandinsky was generally regarded as an apolitical man, and surely the spirituality about which he wrote so movingly involved a rejection of all external forces, and thus could make him an anomalous figure in the socially aware ambience of the Bauhaus. In the 1920s, however, it was still possible to sense a relationship between the romantic individualism of Kandinsky and Klee and a larger progressive social enterprise, a connection that would become increasingly fraught in the 1930s, as the Depression and the rise of totalitarianism on the right and the left turned anything that suggested art-for-art’s-sake into the ultimate dissident position. Kandinsky came to the school to teach form and color, but in short order he took over the mural-painting workshop, and later that year he produced mural designs for a room in an art exhibition in Berlin. This was not the act of a man who intended to remain in some fin-de-siècle ivory tower. Kandinsky’s maquettes, with flurries of forms cascading across dark fields, were turned into full-scale wall paintings by his students, a sure sign that Kandinsky was not indifferent to the promise of a communal avowal, or to the possibility of teaching younger artists how to work broadly and publicly. But for Kandinsky public art did not signal the end of a more personal avowal, and a few years later he was instrumental in setting up at the Bauhaus a free painting workshop, where the art of painting could be pursued for its own sake, without reference to any other artistic activity. At the Bauhaus, Kandinsky’s visual language became cooler, a system of signs and symbols through which he demonstrated the narrative possibilities of an abstract art. Many of the most beautiful works of his Bauhaus years are on paper, where we see his increasingly exacting analysis of his own moods, the conflicts between light and dark, hard and soft, geometric and biomorphic traced with a thrilling graphic exactitude. American critics, beginning with Clement Greenberg in the early 1940s, have seen in the architectonic discipline of the Bauhaus years a weakening of Kandinsky’s art, but this strikes me as mostly a prejudice in favor of the painterly that cannot be justified by an unbiased examination of the work. Kandinsky remained at the Bauhaus until it finally was closed by the Nazis in 1933. He moved to Paris in that year, and although various efforts were made to help him emigrate to the United States, he remained there through the Occupation and died in December 1944, only four months after the Allies liberated the city. In Paris he became, rather like the aging Poussin three centuries earlier, a romantic turned stoic who was still in some philosophical sense a supreme hedonist. Thirty, with that many black and light gray rectangles arranged in a checkerboard of subtly shifting dimensions, draws its ebullience from the watchmaker’s precision of Kandinsky’s draftsmanship. His panoply of jots, dots, squiggles, and arabesques, although rendered in black and gray, illuminate a monochromatic palette, suggesting color incarnate. Sky Blue, from 1940, is one of the greatest of all Kandinskys, with shivering, quivering forms suspended in a delicate blue infinity, as sublime as anything by Fra Angelico. At the Guggenheim, the Kandinsky show fills the entire rotunda, with graphic works occupying galleries to the side. There are aspects of this exhibition that one might criticize. Perhaps the balance is slightly off, with a little too much space devoted to the early years. But the show, which has already been seen in Munich and Paris, is the Guggenheim’s first full presentation since the 1980s, and I do not think we can ask for much more. Tracey Bashkoff of the Guggenheim is the curator in charge, and I mean it as high praise when I say that this exhibition offers no theory, no hypothesis, only a great artist straight on. It is not easy for curators to resist the temptation to give historical material a dramatic spin, and no one ought to underestimate the quiet steadiness of purpose that Barry Bergdoll and Leah Dickerman have brought to their retelling of the Bauhaus story. This is an exhibition in which everything falls into place. The emphasis feels exactly right. 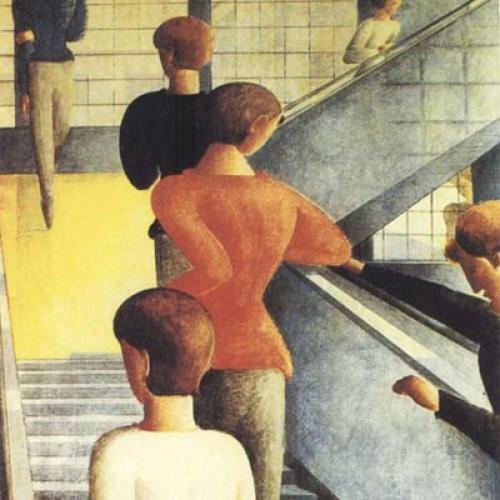 Consider the perfect-pitch handling of Oskar Schlemmer’s Bauhaus Stairway, the painting of figures moving up the stairway of the Bauhaus building in Dessau that for years was one of the very first works visitors encountered at the Museum of Modern Art, where it hung in the museum’s own stairway, an invitation to the permanent collection. Painted in 1932, after the Nazi party had shut down the Dessau Bauhaus, the canvas was, as Andreas Huyssen observes in a skillful catalogue essay, a “melancholy memorial to the Bauhaus’s utopian ambition.” Hanging toward the close of “Bauhaus 1919–1933: Workshops for Modernity,” Bauhaus Stairway is indeed a work in a valedictory mode. The show might have ended with the Schlemmer painting, a sentimental favorite, but the curators have chosen not to close on this theatrical and somewhat downbeat note, preferring to acknowledge the power of Schlemmer’s composition and then shift our attention to the more subtly imaginative achievements of Klee, Kandinsky, and Josef Albers. If there is going to be some criticism of “Bauhaus 1919–1933: Workshops for Modernity,” it will probably echo the old complaints about Alfred Barr’s--and his successor William Rubin’s--historical exhibitions. These were sometimes said to underestimate or downplay the relationship between art and political and social forces. Although not always stated outright, there was a suggestion that by presenting what their detractors described as an essentially formalist reading of modern art, Barr and Rubin were making modern art more palatable for an upper-middle-class audience. Meyer Schapiro criticized Barr’s “Cubism and Abstract Art” as “essentially unhistorical” back in 1936, two years before the Bauhaus exhibition was mounted, and although by the time he spoke at Barr’s funeral Schapiro had changed his opinion, there always seems to be somebody who is ready to argue that the Modern is denying the political and social implications of modern art. My feeling is that Bergdoll and Dickerman understand what Barr understood, namely that the duty of a museum is to present the visual material in the most lucid and powerful manner possible, allowing museumgoers and scholars to draw their own conclusions. Bergdoll and Dickerman are well aware of the controversies that have always surrounded the Bauhaus, ranging from attacks on the allegedly dehumanizing qualities of the Bauhaus style to complaints that the school was less interested in transforming society than in finding a place for its products in the marketplace. “Bauhaus 1919–1933: Workshops for Modernity” is bold yet richly detailed, clear yet never simplistic--it is everything that we want from a Museum of Modern Art show. I do not think it is incidental that both Bergdoll and Dickerman are relative newcomers to the institution. They have no use for the postmodern rehashing of the museum’s history that made such an unholy mess of “MoMA2000,” the Modern’s attempt to assess its own past before construction began on the new building nine years ago. Bergdoll and Dickerman have embraced the museum’s enormous role in the history of the Bauhaus without self-consciousness or embarrassment. They understand that the extraordinarily variegated achievements of the Bauhaus can speak for themselves, if only they are given a chance. So go to see “Bauhaus 1919–1933: Workshops for Modernity” and let the works speak to you. See where your thoughts lead. See what you discover. The Nazis may have shut down the school, but they could not dampen the Bauhaus spirit. We are all still students at the Bauhaus, especially this autumn in New York.